Maintaining the OWL values and assumptions established in the first edition, the second edition introduces new content, activities, perspectives, language, and resources for today’s young teens. New topics include body image, social media/internet, bullying/bystander responsibilities, and consent education. Popular activities and discussion topics remain, and users have more options for alternate activities and multi-media resources to accommodate their participants’ specific needs and interests. A new chapter offers suggestions for including youth with special needs in OWL programs. The second edition is comprised of twenty-five ninety-minute workshops in a new order that will make it easier to plan OWL programs that suit participants’ increasing comfort and schedules. Pamela M. Wilson has taught sexuality courses in several universities, staffed national sexuality training initiatives, and written or co-authored more than sixteen curricula. She served on the Board of Director for the Sexuality Information and Education Council of the U.S., and Answer at Rutgers University. The theme of this year’s GA was “Love Reaches Out,” inviting Unitarian Universalists to consider ways that we can carry our faith beyond the walls of our bricks-and-mortar congregations and engage in new ways of sharing our beliefs and values with the wider world. 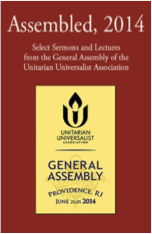 We gathered in Providence, Rhode Island, to talk about the future of Unitarian Universalism and the opportunities of challenges of liberal religion in the twenty-first century. This eBook includes the Berry Street Essay by Rev. Lindi Ramsden, the Fahs lecture by Rev. Mark Morrison-Reed, the Ware Lecture by Sister Simone Campbell, and sermons from the Service of the Living Tradition (Rev. Rebekah Montgomery) and the Sunday morning worship service (Rev. Mark Stringer). 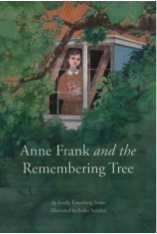 Anne Frank and the Remembering Tree by Rabbi Sandy Eisenberg Sasso. Bestselling children’s author Sandy Eisenberg Sasso tells the story of Anne Frank and her sister Margot and their time in hiding from Nazis in the Secret Annex. By narrating the story from the perspective of the tree outside the Annex window, Sasso offers an age-appropriate way to open a conversation with even young children about hate and persecution. “Nature gently conveys how life continues despite loss. I wanted little ones to find hope in the possibilities of new beginnings without being afraid,” Sasso, winner of the National Jewish Book Award, explains. The book, written for ages 6-9, is co-published by the Children’s Museum of Indianapolis and Skinner House Books. The museum, the largest children’s museum in the world, is the first U.S. recipient of a sapling from the tree and houses a permanent exhibit called “The Power of Children,” about Anne Frank, Ruby Bridges, and Ryan White. Here is a video about the Secret Annex. Rabbi Sandy Eisenberg Sasso is an award-winning author of thirteen books for children, including God’s Paintbrush, The Shema in the Mezuzah (winner of a National Jewish Book Award), and Creation’s First Light. There are more than half a million copies of her books in print throughout the world. Erika Steiskal grew up in Ohio and received a BFA in illustration from the Columbus College of Arts and Design. Her book and editorial illustrations have appeared in Spectrum, 3×3, and Communication Arts, and her work received a gold medal from the Society of Illustrators Los Angeles. She lives in Seattle. By Jade C. Angelica. Reviewed in Tikkun Daily on November 3, 2014. 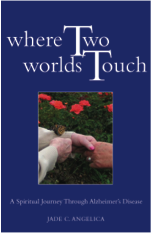 Where Two Worlds Touch has earned glowing reviews in ForeWord Reviews, Science of Mind Magazine, Journal of Pastoral Care and Counseling, U.S. Review of Books, National Catholic Reporter, Journal of Health Care Chaplaincy, and Dementia.